At its best, Dear Elizabeth, adapted by Sarah Ruhl from thirty years of correspondence between the American poets Elizabeth Bishop and Robert Lowell, is an eloquent tribute to the beauties of the friendship between two difficult, prickly, prodigiously talented and prodigiously damaged people. The focus here remains mostly on their artistic work; although we’re aware of Bishop’s struggles with alcoholism and Lowell’s frequent hospitalizations for treatment of his bipolar disorder, of Lowell’s divorces and the suicide of Bishop’s partner – Lowell was married three times, though for most of the period covered here his wife was the novelist and critic Elizabeth Hardwick, and Bishop’s partner for fifteen years was a Brazilian architect, Lota de Soares – a lot of this comes in stage directions. Only occasionally do the letters plainly discuss these deeper currents and major life milestones (other than Pulitzer Prizes, which both poets won over the course of their correspondence). Lowell tends a bit more toward openness and confession than Bishop, but the letters, or at least as they’re presented in the play, still still largely skirt explicit emotion—and often handles it retrospectively, as a “road not taken” in the past rather than a head-on conversation in the present. It’s rare to see a friendship (even friendship that occasionally takes on romantic overtones, though always shies away before anything like consummation) as the driving human relationship of a piece of drama, even rarer to see a friendship where the two parties met in person at most once a year. Nonetheless, they were confidants of the heart on the subject that most mattered to them: their poetry. They depended on each other for artistic understanding, poetry-world gossip and frank appraisals of their colleagues, and a comprehension of each other’s work that sometimes eluded even their romantic partners. There are times though when the piece feels handicapped by the restraint inherent in all its components: the central relationship, which was mostly conducted from different continents through correspondence that sometimes grew infrequent or consisted of one writer nagging the other to write more often; the structure of the play, which does not allow for conversation except in elliptical fragments woven from those letters; the big hunks of prose; and the reticence of these two, sometimes almost stereotypically stoic New Englanders, who shy from making too much of the events, no matter how large, in their own lives. The letters themselves are never uninteresting, but the quotidian, matter-of-fact course of this friendship can’t always be translated effectively from the interiority of private letters to the public declamation of monologues. 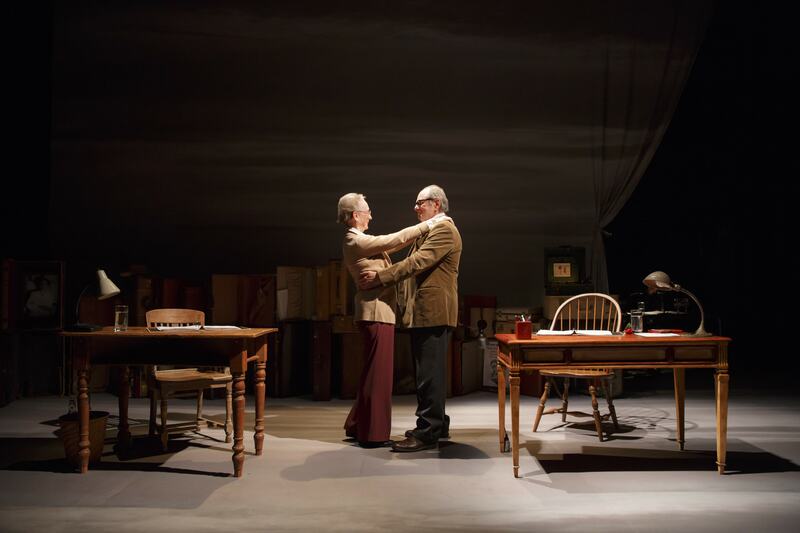 Even the strongest actors (Chalfant and Yulin this week; the cast will change weekly throughout the run), the direction and the elegant, genteel clutter of Antje Ellermann’s set, can get weighed down by this tendency towards the static. Having said that, it’s also worth noting that the intentness and focused energy that both Yulin and Chalfant, Chalfant in particular, bring to the act of taking in the letters as the other “writes” to them, are a master class for actors in how to be fully present and engaged while on the listening end of a monologue. The formality of the prose seems counterintuitive, as well, for a writer like Ruhl, known particularly for her particular and wonderful language, oblique yet precise and rippling with musicality. You can see why the challenge of working with other people’s words—other people’s formal, structured, restrained diction—appealed to her, but you can also see her capacious theatrical imagination straining the seams of the challenge. Her imagistic side creeps through in stage directions, stripped down here to part of the text, and read aloud by Polly Noonan, who serves as a sort of deus ex machina, narrating the extra-correspondential events in Bishop’s and Lowell’s lives and also delivering and removing props as needed, which paint pictures of the tide rising and receding, of Elizabeth boarding her own personal planet for its vantage point, of the play’s varied locations, sketched in by different qualities of sky-light on the backdrop. The cast throughout the run will include other wonderful actors, a different pair each week, including Cherry Jones, Peter Scolari, Ellen McLaughlin, John Douglas Thompson, and more; differences between performers will add texture, and the piece would perhaps gain from being seen in such a triangulated way (and repeat viewings are explicitly encouraged in the program). Still, it feels more like an experiment, though a highly worthy one, than a fully satisfying theatrical experience.